Besides being a great sport, many enjoy fishing because it can provide relaxation and time for contemplation. But the “entertain me now” generation who wants more fast action and less yawning have invented a new fishing sport and it’s called skarping. 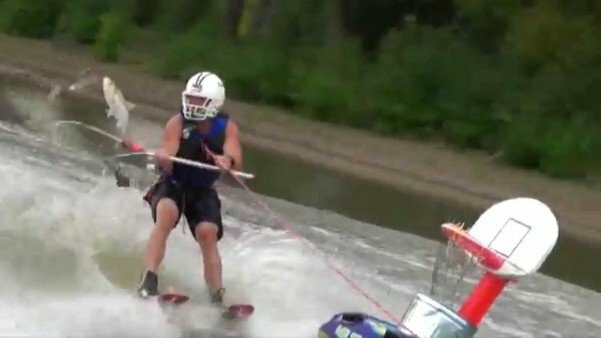 What could be better then a sport that combines water skis, a football helmet and a padded life jacket? Throw in a fishing net and a floating basketball hoop and you’re ready to go skarping. The goal is to throw as many fish into the basket while getting towed behind a boat. Now this is a sport that’s clearly born out of an abundance of fish. The sport originated on the Illinois River where the waters are full of Asian carp. The Asian carp is a species of fish known for a thick, hard head and the tendency to jump eight to ten feet in the air when startled. He still takes people on bowfishing trips – at $140 per hour per group – but doesn’t take them skarping because he can’t get insurance to cover it for reasons that seem fairly obvious. But Wallick and his friends have refined the sport from the more brutal beginnings when they incorporated pointed garden tools and spears. Even though they’ve made changes, some animal rights activists are still crying foul. Wallick says that the Asian carp have heads made from “solid bone” so the football helmet and padded vest are for protection, he tells Ozy.com. His crew gets the fish hopping when they fire up the two-stroke motor on their boat. They waterski behind that aluminum boat, scooping the jumping carp out of the air and tossing their catches into a floating basketball hoop that drags alongside the boat in a tube. And in case you’re wondering, they eat their catch or use it as fertilizer. The fish jump most between June and October, especially in warm and shallow water, but to try the sport you’ll have to travel. In North America, Asian carp are almost solely found in the Mississippi, Missouri, and Illinois rivers.